Jesse and Saul Rothschild of St. Francisville, Louisiana showing off a beautiful Rogue River Springer. 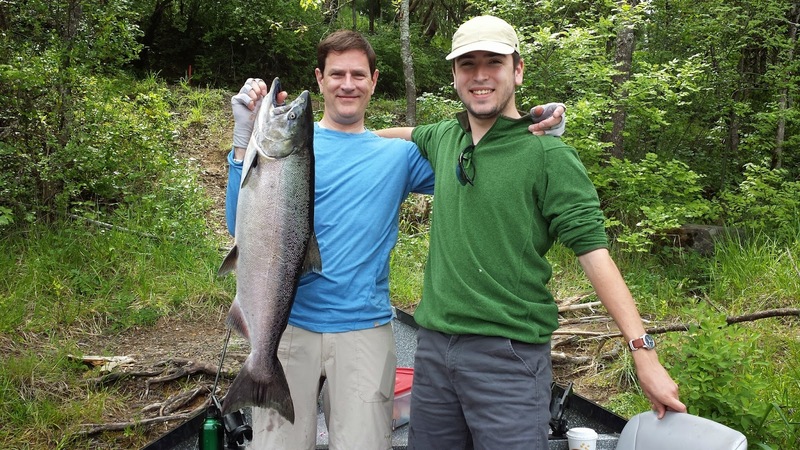 Father and son Jesse and Saul Rothschild of St. Francisville, Louisiana came to the Rogue River with high hopes of getting their chance at some big Salmon. They would find out just how challenging yet rewarding these early Springers truly are. A fish that consumes countless hours of anglers lives all across the Pacific Northwest, the Spring Chinook Salmon is the ultimate sport fish! ﻿﻿We started the day off pulling plugs and divers with no such luck so a few holes into the morning we switched over to back-bouncing. Ten minutes into fishing I noticed that Jesse and Saul were getting the technique down pretty good with the assistance of our 4 and 5 ounce weights. Each hole is rated for a specific amount of weight ranging anywhere from 1 to 5 ounces. Choosing your weight size depends mostly on current speed and depth of the hole. Using heavier led is best when you're learning this method simply because your weight hits the bottom harder and you feel it better when it does. However, in most cases 4 and 5 ounce weights are too heavy on the upper Rogue River. As we drifted through the morning we gradually lightened our led sizes and became familiar with the more common weights ranging from 1 1/2 to 3 ounces. Saul had the magic touch in the early morning getting two salmon to bite but unfortunately was unlucky with keeping the fish on. That feeling is one that every angler out there has felt before and should get used to feeling...because it's part of fishing. About 5 minutes into bouncing through "the last chance hole," it finally happened! Jesse felt his first bite of the day, thumbed down and got a great hook set. My head whipped towards the sky so that I could get eyes on the tip of his rod. When I did, all I seen was massive head shakes. The adrenaline was racing and after a nice long fight full of drag peeling runs we finally got the fish to the net. 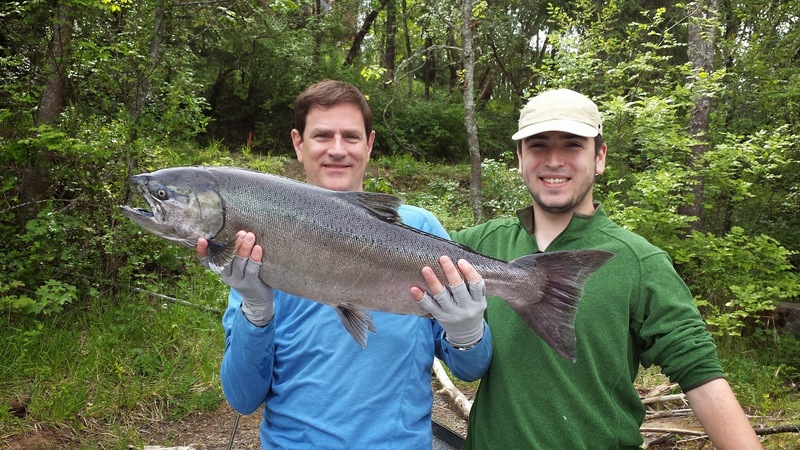 It was a beautiful 34 X 21 inch hatchery Spring Salmon and Jesse's largest fish caught to date.